Some of the early-planted corn is beginning to tassel. We are entering the reproductive portion of a plant's lifecycle. Count ahead 6 weeks – this is when you need to get serious about checking the maturity of your fields. We mark the calendar from the first tassel(s) as a reminder to begin preparations for the next month so we can begin to stage the silage harvest. Note: most of the difference between hybrid relative maturity is between VE and VT – things progress very similarly regardless of hybrid once we enter the [R]eproductive Stages. Reproductive Stages – How many days to ½ milk line? Should we apply fungicide to corn used for silage? 1. MAYBE!? Disease pressure, hybrid susceptibility, and application timing are critical. 2. In the Northern Grain Belt, we’ve had plenty of moisture and heat to push disease pressure. 3. Review hybrid ratings with service providers to select genetic platforms likely to respond favorably to application. 4. Assess field history – do we have fields harboring or more likely to harbor diseases? Why apply fungicide on SILAGE? What are Soybeans Doing Today? What is my CORN Doing today? What does this mean? For easy math, assume 20 GDU’s will accumulate per day in June and into the first part of July. A new leaf collar can be found in your field every 4 days! If you are really bored, you could watch the corn grow this time of year. The growing point and tassel rise above the soil surface at V6. o What does this mean? 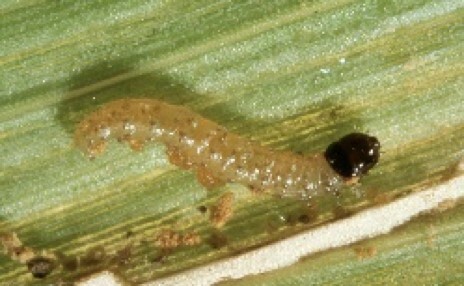 If corn is damaged at the surface or defoliated, it is unlikely to regrow. The number of kernel rows is determined at V7-V8. o What does this mean? Corn is going through the awkward stage of rapid growth…it’s the nature of the beast. o What does this mean? Some of these products are necessary to control our late-emerging broad leaves. The interaction is common and manageable with hybrid selection and placement…follow the herbicide label! NITROGEN INHIBITORS – SNAKE OIL OR STAPLE OF PRODUCTION? Not all controlled-release Nitrogen products are created equal…matching the right product with the application method and farming practices is important. The easy answer is: some work, some don’t. However, if used properly, a few products have proven viable. processes. An additional polymer coat may be applied. o Urea-Formaldehyde/Methylene Urea: by reacting with aldehydes, compounds with high molecular weights and complex chemical s structures with low water solubility can be created. o Urea-Triazones: aldehyde+ammonia reacted with urea in an aqueous medium under controlled conditions which results in a liquid fertilizer as a stable solution in both a triazone form and unreacted urea [UAN]. 1. Slow Green-Up: within the field, if portions are green and others remain brown it’s time to check these brown portions. 2. Partial Crown Growth: spring growth is determined the prior fall. Parts of the root [linked to the crown, which initiates buds] can be damaged leaving only a part of the plant viable. 3. Uneven Growth: some buds may be damaged over winter. New buds may be initiated, but these shoots will be shorter than surviving bud shoots. 4. Roots: take a look at the roots by digging them up. Healthy tissue will be white, while damaged tissue will be brown or a dark discoloration. More damage equals less production; roots can be so damaged they rot and the plant will ultimately die. Healthy roots should be firm and white. If the root is soft and water can be squeezed from the root, it is likely winterkilled. If over half the root is showing discoloration/signs of rot, it will most likely die. If less than half the root is showing symptoms of rot, it has a favorable chance for surviving the season [or potentially more than a season]. 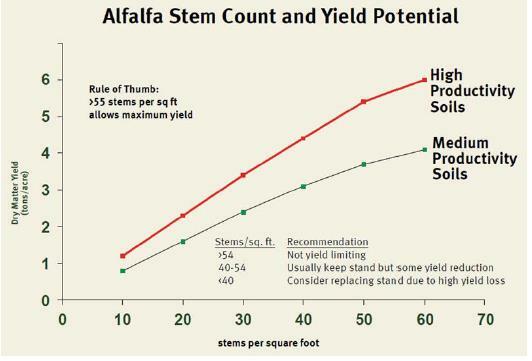 Stem density of 55/ft2 has full yield potential. Take density counts after green-up and stand is at least 4” tall. Older stands have less plants but those remaining plants will produce more stems; make sure to evaluate STEMS – a field with less than 55 stems/ft2 is a candidate for rotation. More acres = more problems, it seems. Picking the right conditions to plant is always the best option, regardless of what the calendar says. For growers needing to cover more ground in such a tight window, the unfortunate reality is that we must push into unfavorable conditions to get done in time. With that being said, we’ve had a fair amount of corn planted in very good field conditions prior to the most recent cold snap. The following is a reminder…an annual reminder of what we are working through this particular spring. 1. Air Temperature Wednesday at 10 am [4/26] was 60°F but fell to the high-30’s by Thursday morning. A day after the front arrived [4/27] average soil temperature stayed up - 47°F at 6 am. The following morning we saw average soil temperature drop to 41°F at 6 am. 2. What does this mean? This is a significant drop in soil temperature over the span of a day. It also rained, and wetter soils push oxygen out of the soil. This starves seeds and limits respiration. Pythium, among other seedling diseases are a consideration in cold, wet soils. 2. What does this mean? Because of the stress already incurred in planted fields, and because we have yet to break the cold weather pattern, we may have a hard time reaching 80%-90% stand uniformity. 1. Delayed planting is generally okay. Statistics on killing frost and other weather events are an AVERAGE – every year is different. 2. Delayed planting adjustment: corn will compensate. According to research at Purdue University [Nielson], corn GDU requirement decreases by 7 GDU/day May 1 – May 15. 3. Statistically speaking, there is no significant drop in yield potential if corn is planted prior to May 8. 4. Yield loss [statistically] week of May 8 – May 15 is LESS THAN 1 bushel/acre/day. So, a minimal drop in total potential can be anticipated if corn is planted prior to May 15. If conditions are NOT optimal prior, a consideration must be made for stand loss to environment factors prior to May 15. The question is, and will always be: will I lose more in emergence than I will to planting date? Frost Heaving: can be found when winter is extremely cold or open. Frost heaving is more likely to occur in heavier soils. A couple of actions kill plants and damage stands in this scenario: a period of alternating freezing/thawing cycles can cause the roots to sheer off [2” – 8” depth] or force the crown above the soil line [up to 6”]. The result is a stand that appears to “dry out” or “dry up” and die. 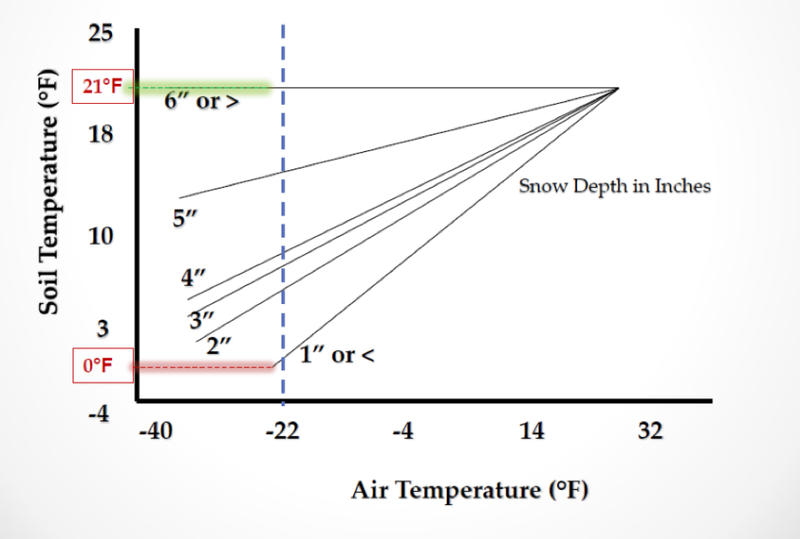 Extreme low temperature: root and crown tissue can be terminated if the soil temperature drops below 15°F. Usually soil temperature reaches these levels due to lack of insulating snow cover. Ice sheeting: happens when rain or meltwater accumulates and freezes in a solid layer above the crowns. Through respiration and because of the ice layer, a high amount of carbon dioxide and ethylene accumulation occurs; combine this with the lack of oxygen [anoxia] and the result is plant death. Carbohydrate depletion: Plants “run out of fuel”. This can happen because of awkward timing of the final cut from the previous year or because of an extended winter and late break in dormancy. Another reason for running out of fuel is due to a false spring – or a false start to spring. Extended early warm-up and premature break in dormancy may cause crown buds to develop new shoots and as temperatures return to average, the shoots are frozen/terminated. New crown buds must form again [IF] there is enough stored carbohydrate (fuel). If carbohydrate root reserves are depleted, the plant may begin regrowth but seemingly runs out of fuel and withers until death. What About 2017? Any of the aforementioned causes of death can be found in the upper Midwest as in any other year, but carbohydrate depletion is of particular concern in Northeast Iowa and Southwest Wisconsin. 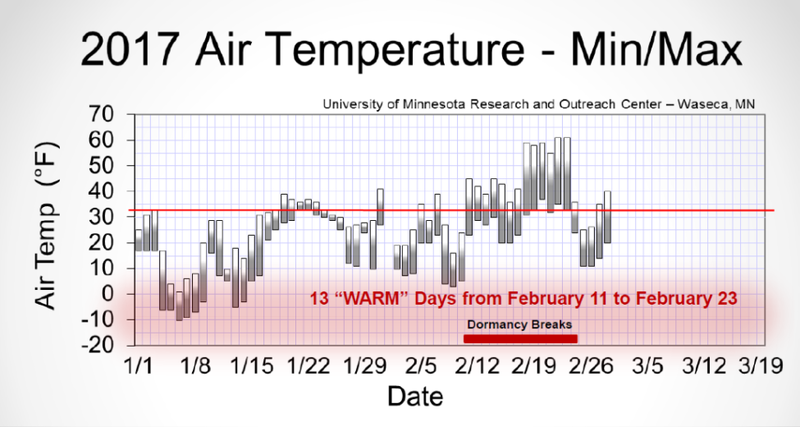 Temperatures have been unseasonably warm, especially in the middle of February. In some fields, a “false start” has occurred and we broke dormancy. This is something we will need to monitor closely as dormancy officially breaks and regrowth occurs. Determine what fields will be productive and what fields will not. Make a plan: determine whether to tear it up, keep it, or wait to make a decision [see how the plants regrow]. This is an article about common sense…mixed with a little bit of science. Despite some folks who are outside of production ag having a contrary opinion, the growers we work with are concerned about minimizing pesticide applications as well as the number of chemistries applied. This accomplishes 2 things: typically lowers the cost in application, and makes things simpler when implementing the control measure(s). Layered Residual is IMPORTANT, if not ESSENTIAL for weed control. A 2-Pass system, combining a pre-emerge/post-plant pass and an early-post pass with residual products is the most effective way to control a weed spectrum that germinates throughout the growing season [not all weeds flush at once]. Large-seeded broadleaves are very difficult to control if not for layered residual chemistry. Multiple modes of action are a KEY component to controlling weeds accustomed to our cropping systems. The cost of a chemical program must be weighed against the cost of improper weed control. Understand what weeds are problematic in your operation. As resistance persists, the problem becomes more difficult to correct. Once you have resistant biotypes in your field, a different approach to control is a necessity. Staying in front of the problem is the best pathway to profitability. Once a problem is recognized, the economics of finding a remedy become more difficult. Click on the link below to view a document that details research DuPont and Pioneer have conducted; it gives an in-depth look at options to fix problems you may or will soon likely encounter with resistance. When it comes to field work, one thing is inevitable – COMPACTION. Compaction is one of those bi-products of modern farming that is both unavoidable and also variable, depending on soil type, management practice, and weather conditions at the time of field entry. · Compacted soils have reduced pore space, few overall larger pores, and a reduced rate of water infiltration; drainage [both surface and sub-surface] is reduced in compacted soil. · The top 2” – 5” of soil experience more than one freeze-thaw cycle per year [freeze-thaw cycles do little to reduce DEEP soil compaction]. · Compaction impedes root growth, thus reducing the anticipated amount of root mass in the subsequent crop. The result is less root surface area for nutrient and water interception. · Yield losses are often driven by reduced water and nutrient uptake. If compaction is the cause of the issue, symptoms will appear worse in growing seasons with lower than average precipitation. · Plants spend energy by respiring at the root surface to take in nutrients. Respiration requires oxygen. If roots intercept nutrients in compacted soil, reduced aeration [pore space] can impede uptake of those nutrients. Potassium can be more affected than other nutrients. · Continuous tillage at the same depth with a disk or plow has been shown to create a compaction layer, sometimes called a “hard pan”. Studies indicate that even with vertical tillage, a “density layer” may persist which inhibits root growth – often this is known as “pancaking”. Picture of pancaked roots in corn. · Wheel traffic is the most significant source of compaction. As equipment has gotten larger, tire size has increased also. This helps to maintain a more constant PSI (pounds per square inch) load. · Larger axle loads from combines, grain carts, or silage wagons exert compaction deeper into the soil profile. On average, axle-loads no larger than 10 tons per axle keep compaction within the first 6” – 8” [a depth easily fixed with tillage]. · Subsoil compaction is hard to alleviate. Many growers may not know that they have subsoil compaction – unless it is seen by a gate/entry point to the field. Compacted layers can persist for years and crops may not show stress from subsoil compaction unless other stresses from the growing season expose the underlying issue. · Subsoil compaction from heavy wheel traffic resulting in a “hard pan” can be found 12” – 18” into the soil profile. Floating vertical tillage implements into the compacted layer can help to fracture the “hard pan”, but when possible, tilling 1” – 2” below the depth of the “hard pan” is the best recommendation for alleviating these dense layers. · Subsoil density layers can be found using a penetrometer. 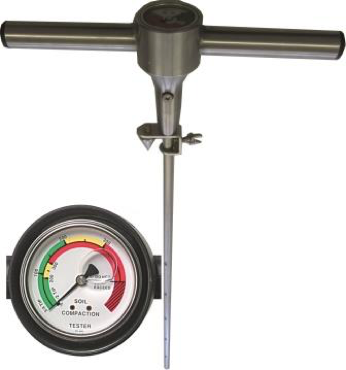 A penetrometer measures the PSI [pounds per square inch] required to physically push through the soil profile. For more information on soil compaction [from mechanical operation], see THIS article from MN Extension. Most would agree that yields [especially in corn] are tremendous in 2016. The high yields provide some much needed respite from low prices for many. The tale of the tape will be read in the offseason, but indications are for one of the biggest crops in history. Many growers have been noticing marginal areas producing much better yields than expected while they also have noticed some historically high-yielding areas are underperforming expectations. Outside of the obvious: flooded/saturated soils….In early May night-time temperatures dipped below freezing and we’ve recognized this as the causative agent for yield reduction, albeit inconsistently. Most growers affected by the frost saw a confusing situation this spring. Diminished, uneven stands looked worth keeping – and they likely were – even looking back. However, we’ve seen as we cross the finish line that although many plants survived and produced an ear, these ears weren’t as robust as neighboring ears that didn’t experience as much stress from the early frost. In fact, we’ve seen reductions in ear weight(s) of 10%-15% due mainly to less rows and ear length [flagged plant to plant observation]. In summary, higher yields may have been possible with a later replant – but it’s still unlikely that a higher economic return would’ve been achieved given these circumstances. View the attached PDF for an in-depth look. A preface should accompany this post: soybean yields [in the absence of SDS] have been tremendous, thanks in part by a growing season that provided ample amounts of rain and seasonal temperatures that extended grain fill to the very end of physiological maturity. We’ve been getting field calls from growers noticing variable soybean seed quality. While adequate moisture increases the likelihood for elevated yields, it can also increase the likelihood of diseases in our soybean crop. What we are seeing is PHOMOPSIS SEED DECAY. Phomopsis is caused by a pathogen in the Diaporthe genus, the same causal organism as POD and STEM BLIGHT. Infection occurs when spores splash from field residue onto the plant/pod; in some cases, weeds present in the field host the disease. The disease reduces quality and can also reduce yield, especially if seeds are aborted. If you find this disease in your field, harvest as soon as possible. Cool and wet conditions will continue disease development into harvest. While genetics do vary in susceptibility, the issue is likely not prevalent enough to select varieties for this criteria alone. Tillage and rotation may help to reduce the amount of inoculum for infection in subsequent cropping years.